A dramatic black eyeliner flick is as iconic a makeup look you can get. Same goes for a vivid red lip. But as simple as they seem, they’re not always easy to create. Enter SHISEIDO’s new Inks range of standout eye and lip heroes that make crafting even the most precise jet-black liquid line a breeze. Steeped in Japanese culture, the collection is based on “shodo”, a traditional form of calligraphy from the fifth century, where an ink-dipped brush was used to paint “kana” characters. The fine arts graphic definition, saturated shadowy pigment, and time-honored artistry were paired with SHISEIDO’s cutting-edge technology to create six novel eye and lip products: intense liquid pens, creamy kajals, innovative gel liners, brazen brow definers, high-shine lip lacquers and one mega mascara. Fittingly, American singer-songwriter Banks, who is well-known for her signature inky, winged-eye looks, is fronting the range. Worn pitch black and elaborately paired with sooty eyeshadow or as a clean graphic cat’s eye flick, Banks’ makeup choices are imbued with the same artistic liberties as her music. Why not channel your own inner Banks and create a stunning makeup look with one (or more) of these reimagined classic beauty tools? Yes, you can DIY a graphic eye à la Banks, thanks to SHISEIDO ArchLiner Ink’s angled micro felt tip. The unique arched shape eliminates any blind spots you often get from where your fingers normally have to sit on a traditional eyeliner pen. You get precision, control and an even flow of inky black pigment with every sweep. Top tip: For a perfect feline flick in seconds, press the backside of the tip along the outer corner of each eye so that the curved portion of the pen is directed towards your temple. 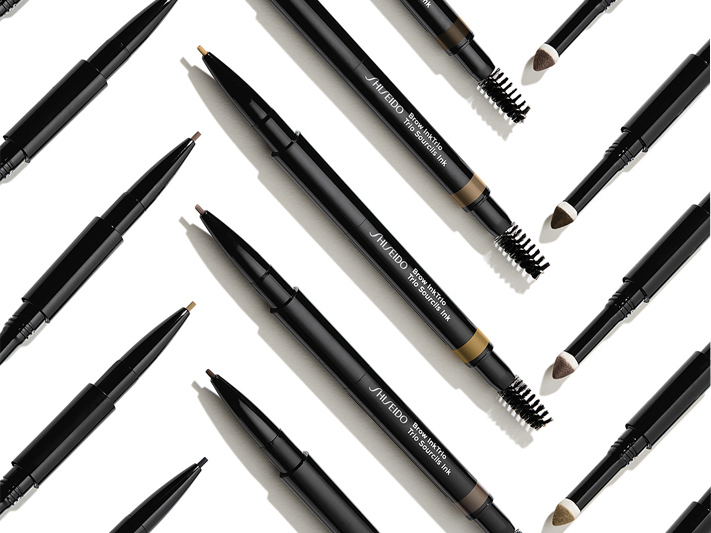 The ever-popular eyeliner formula gets an upgrade thanks to Thermo-Sensory Technology in the new SHISEIDO MicroLiner Ink. The solid gel transforms into a liquid once drawn over skin, forming a flexible film that simply won’t budge. Five rich, matte shades, including navy, white and plum, take inspiration from “sumi”—ink sticks used in Japanese calligraphy. Top tip: The skinny tip is ideal for dotting color into the lashline, adding drama to any liner shape. This isn’t your average smudgy liner. 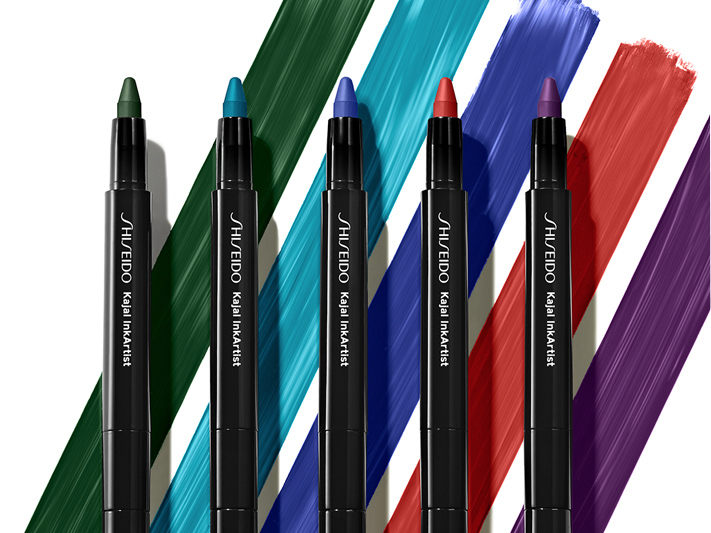 The multi-tasking SHISEIDO Kajal InkArtist boasts a shadow, liner and brow pigment in one. The chunky tip is ideal for coloring over lids, while a built-in sharpener ensures it’s still precise enough to line the waterline with ease. Top tip: Traditional Japanese shades (such as imperial purple) have been given a rebellious edge. Try a swathe of Kabuki White from brow bone to lashline to guarantee you’ll turn heads. 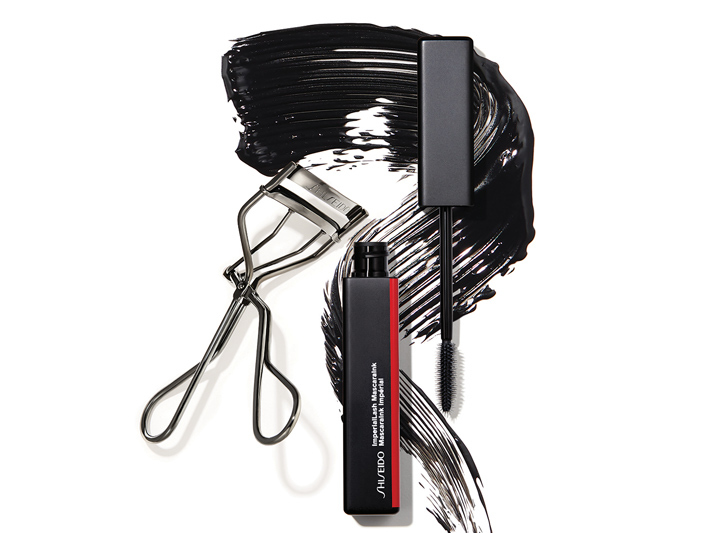 The genius is in the packaging of the SHISEIDO Brow InkTrio. There’s a spooly for combing through color, an ultra-thin matte pencil for painting on hair-like strokes, and a pre-loaded pearl-infused powder to give brows guts all in one sleek pen. The result is defined arches that look real rather than painted on. Top tip: The brow powder comes one shade lighter than the pencil so you can wear it alone or layer it over top to add even more depth. Never dry, never sticky, a unique mix of the perfect amount of oils makes this liquid lippie formula just right. Think of it as the Goldilocks of the lip category. 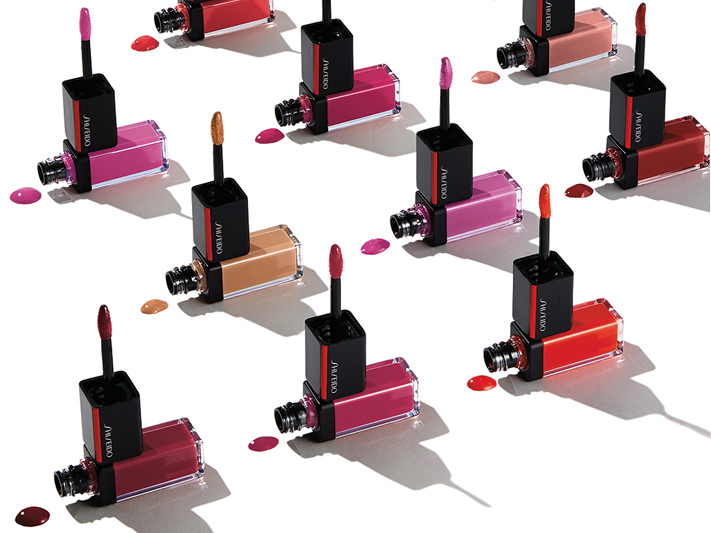 The high-shine finish and high-intensity pigment lasts a solid four hours, all while hydrating lips too. Top tip: For added definition and staying power, use a lip pencil in a similar shade to color in lips first before applying SHISEIDO LacquerInk LipShine. The innovative brush of SHISEIDO ImperialLash MascaraInk is made up of a unique soft silicone material and staggered bristles that create a reservoir of color to separate and define even the tiniest of lash hairs without a clump in sight. Top tip: The rich, velvety black of sumi calligraphy ink was the inspiration for this mascara’s vinyl finish. Use the crown-like tip of the wand to give guts to wimpy corner and bottom lashes in a flash.